I was invited to the re-opening of the Miura Waffle Bar on Main and Broadway for some waffle and drink samples. Their new location looks nicer and more modern. I was also about to eat more waffles than I have in my entire life (ok not really). 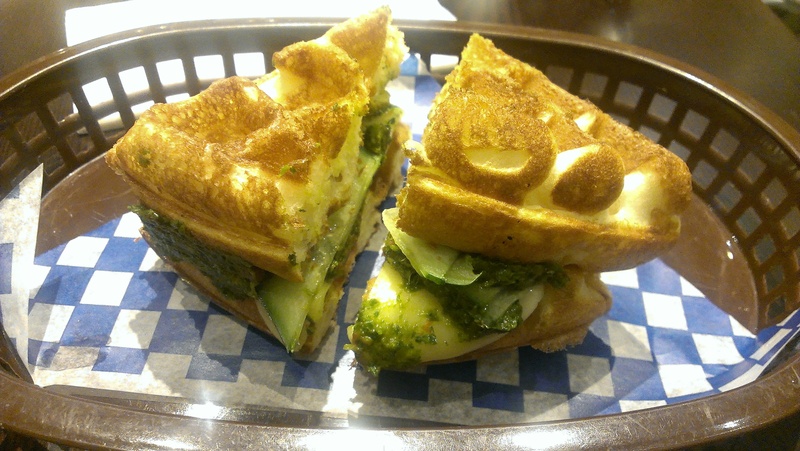 Miura serves American style waffle sandwiches and each has its own twist. They’ve also been featured on You Gotta Eat Here. First they gave us some samples of their new milkshakes. The milkshakes all look the same in my photos so I won’t post them. There was a Sweet Corn and Vanilla Ice Cream Milkshake. It tasted surprisingly good because it was sweet from the ice cream and the corn also tasted sweet and gave you s0mething to chew on. 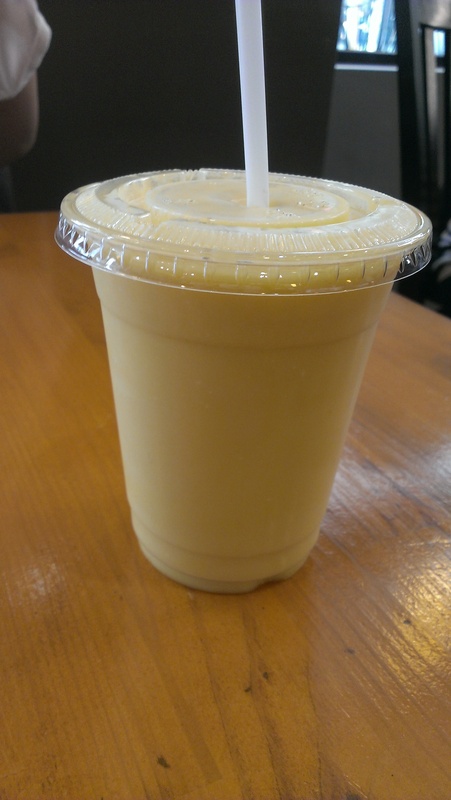 There also wasn’t so much corn that it was too thick and smoothie like. Not weird at all! 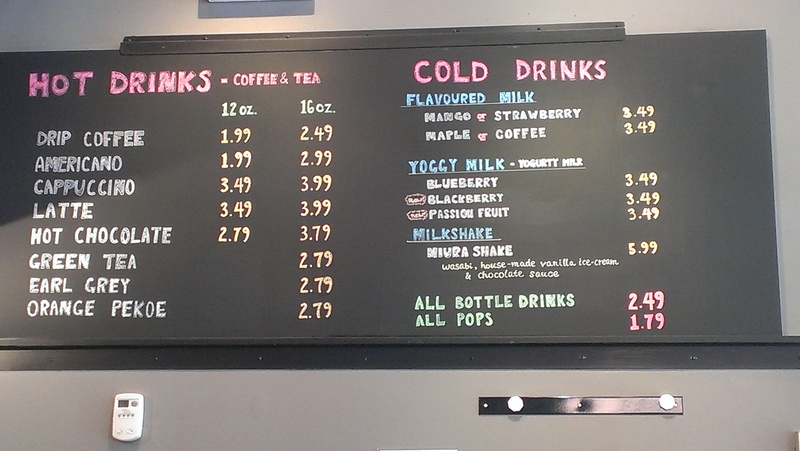 The next milkshake was the G8 with lots of beans (red bean, green bean, white bean, mung bean???). It smelled a bit like sesame oil and the texture was more grainy from the beans. It was alright given that there were so many beans and I don’t really like beans but it’s not my thing. It’s suppose to be healthy though. The sandwich on the left was the Japanese inspired Salmon Wasabi sandwich. 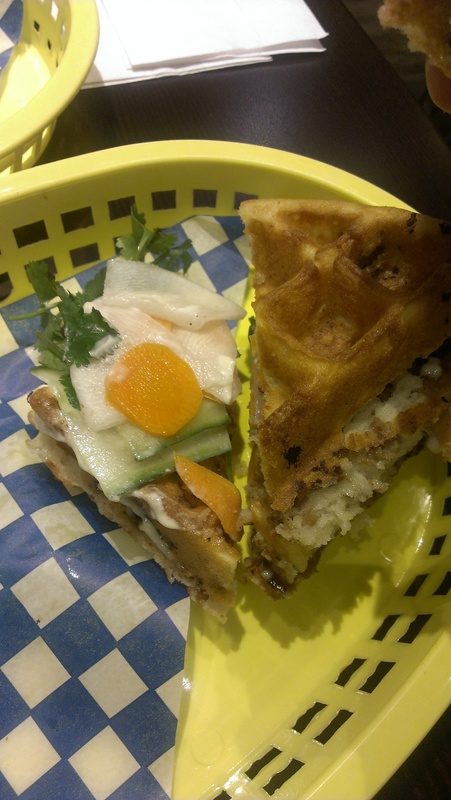 The salmon was infused into the waffle batter. The salmon was moist and smooth almost like smoked salmon and the mayo provided the wasabi flavour. I love how their waffles are very soft and fluffy. There was just lettuce inbetween the two waffles so this was a lighter sandwich. The one on the right is the Burger King? I think that’s what she said… It had beef, kimchi and egg. The beef was also infused into the waffle batter. This was a heavier sandwich and there was a lot more filling. As you can see from the picture this one had a darker looking waffle so it was crispier and the salmon one had a less crispy waffle. Both were good in my opinion. 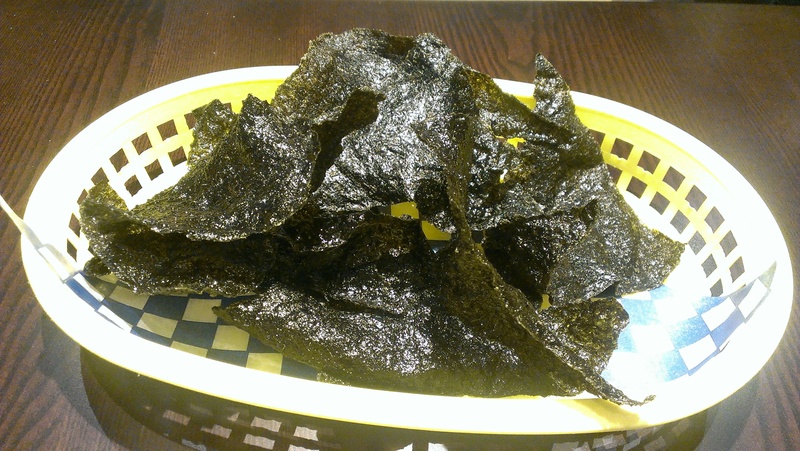 Next we had some Nori Chips. They were oily and not that flavourful. I think more salt would’ve helped. They tasted thicker and crunchier than regular seaweed but I would pass on this. This was a Vietnamese inspired sandwich made with different pickled vegetables and hoisin sauce. I liked this one since it was light and I like pickled vegetables. This was one of my favourites! It was an Italian inspired sandwich with cheese, cucumbers, and tomato pesto. Okay I was SO FULL at this point but dessert sandwiches were next. Don’t worry I didn’t eat all of these I just had about half or half of the half… This had cranberries and whipped cream. It wasn’t particularly special so I would pass on this. Dessert round 2! This was the Banana Caramel sandwich with whipped cream. It was pretty good since it’s a pretty classic combination. This was my favourite dessert sandwich. I know it doesn’t look like much in the picture. It was suppose to taste like salted caramel but the server said that it was a sweet teriyaki sauce??? There was also whipped cream and ice cream and this was delicious. Except it was also extremely messy to eat due to the melting soft serve ice cream. The teriyaki sauce does not taste like teriyaki sauce so you’ll never notice it there but it did have that salted caramel flavour and I still wanted to eat it despite sampling their entire menu in one night! Thanks for inviting me Miura Waffle! 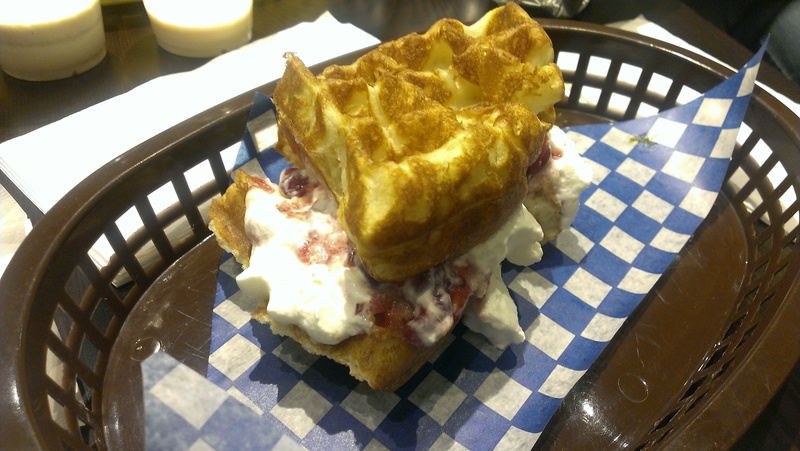 They do have some interesting waffle sandwich creations inspired by different cuisines and I would recommend a visit for their savoury waffles! The dessert ones aren’t too exciting but if you want something simple they’re alright. If you want to see more waffles, see my previous post. This entry was posted in Desserts, Food Reviews, Japanese and tagged milkshakes, Miura Waffle and Milk Bar, waffle sandwiches, waffles. 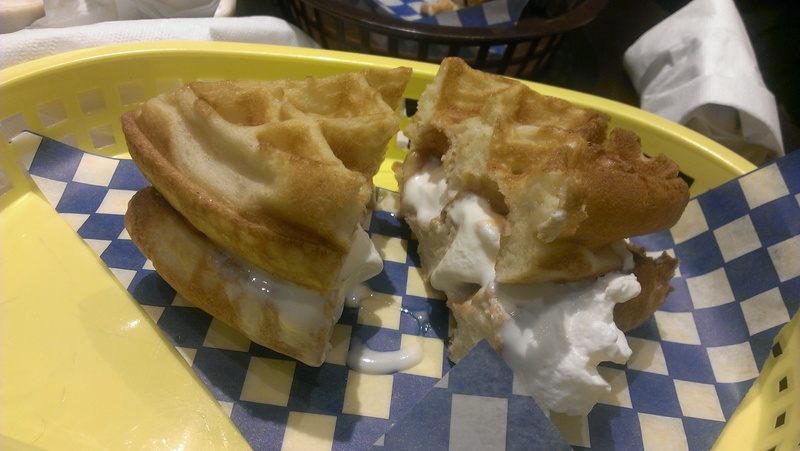 After reading some food blogs about Waffles Gone Wild (in particular Sean’s Adventures in Flavor Town), I suddenly had huge cravings for waffles. When I did try to go to Waffles Gone Wild they were closed that day (Tuesday). =( That was last month and since I STILL didn’t get my waffle fix yet, my BFF and I went to Miura Waffle and Milk Bar instead. It’s located right next to the bus stop on Davie St and Howe. 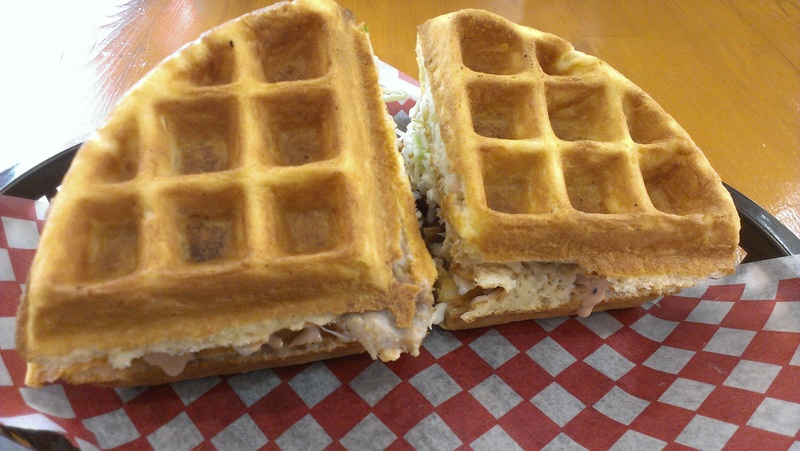 They specialize in Japanese style waffle sandwiches and they were also featured on Food Network’s “You Gotta Eat Here” show. Miura offers a yogurt milk drink called a “yoggy milk” and we decided to share one. We had the passion fruit flavour but we both found it to be too sour. 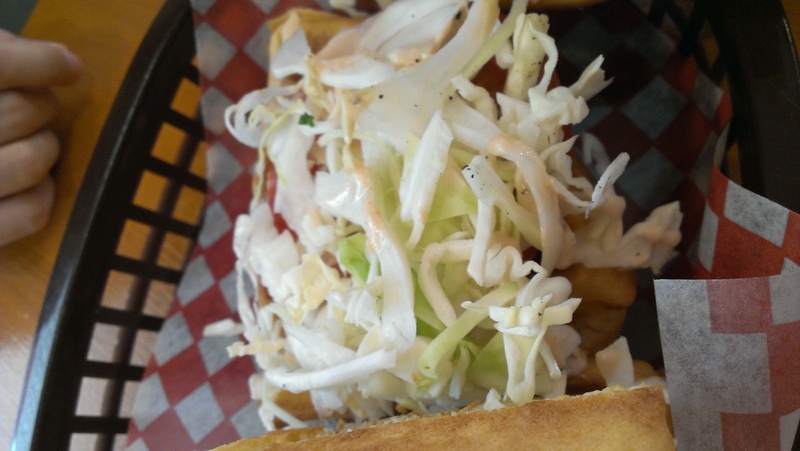 It left a strange aftertaste in our mouths after. You do sort of get used to it but not really. Maybe the blueberry would have been less sour. 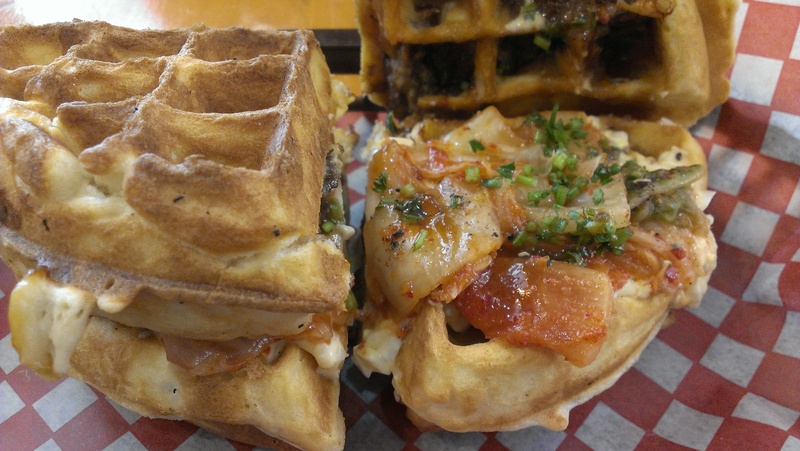 Their menu consists of more savoury waffle sandwiches than sweet ones. I had my eye on the Banana Caramel but I couldn’t resist getting the Bulgogi instead since it sounded a lot more interesting! 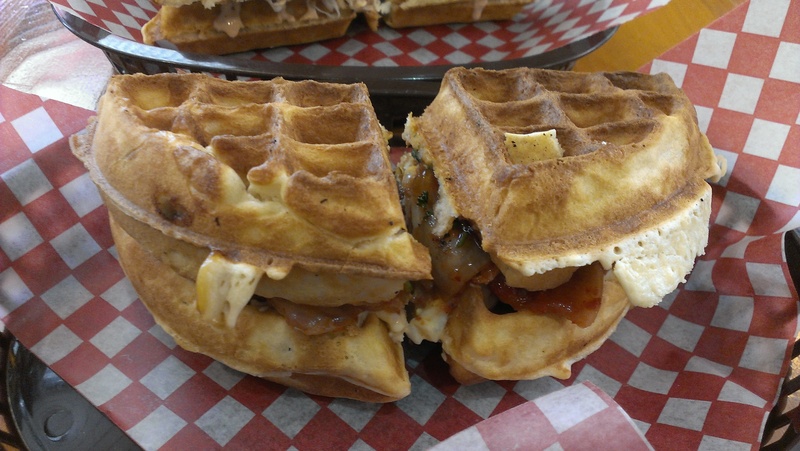 It was also their signature waffle sandwich as well. I don’t regret getting the Bulgogi at all! 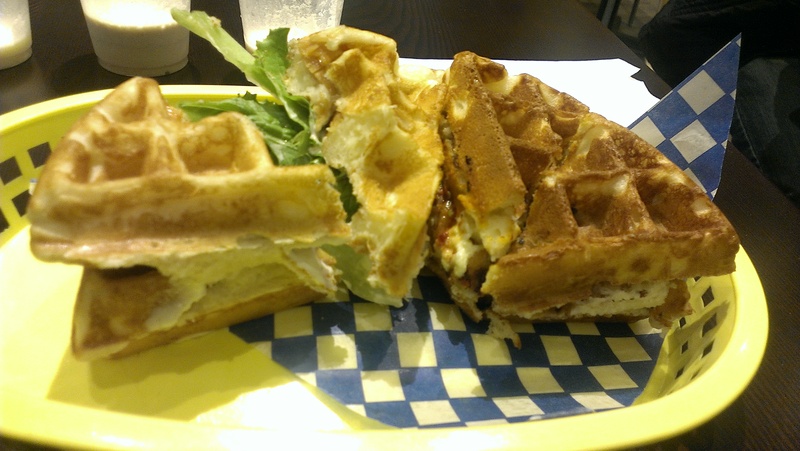 The waffle sandwiches were really big and I was pretty full after! The waffles were crisp on the outside and soft and fluffy on the inside. 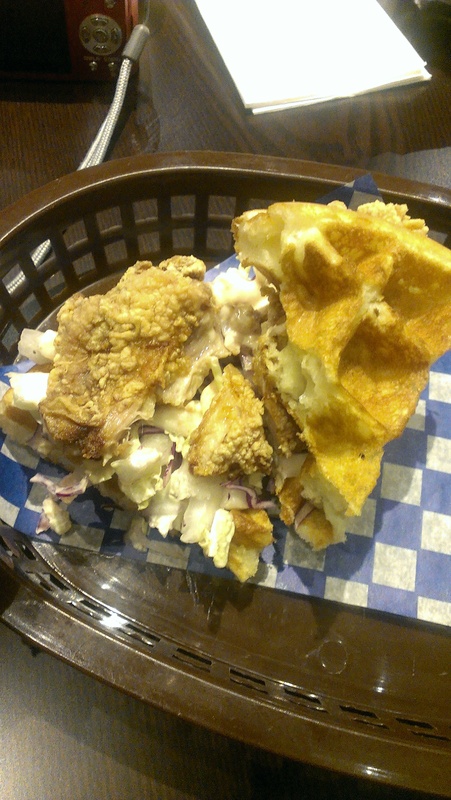 The inside of my sandwich was full of kimchi and egg while the bulgogi was actually cooked with the waffles! It was a super tasty sandwich but the only slight downfall was that I found the bulgogi to be dry and lacking in flavour despite the bulgogi sauce they used. Maybe they should have marinated it longer. Guess you can’t win em’ all but it’s still a really good sandwich! We were both really pleased with our experience here! I never knew a waffle could be turned into a sandwich but I guess any sort of bread works right? They also have a sign that says they do not serve the food with cutlery so it is meant to eaten with your hands. The dining space is not too big but they do have a small patio area outside. I would definitely recommend a visit! 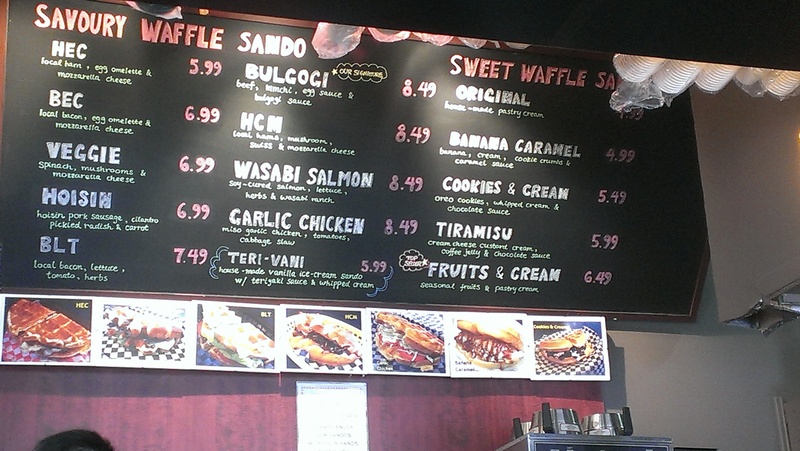 Next up: Hopefully a visit to Waffles Gone Wild! No I have not forgotten you yet (along with the hundreds of other places I need to try)! 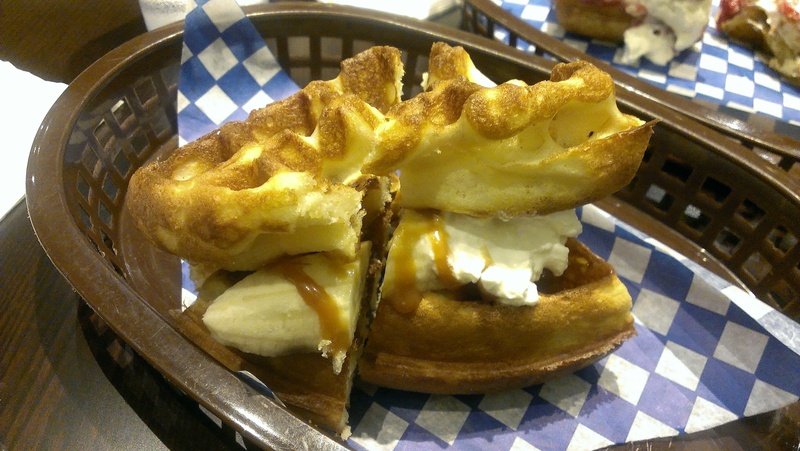 This entry was posted in Desserts, Food Reviews and tagged Miura Waffle and Milk Bar, savoury, waffle sandwiches, waffles.